I just finished installing a new garage door opener. Although it took a few hours and a second pair of hands, the actual installation was pretty straight forward. My old garage door opener had lasted for almost 22 years. Although still working it was beginning to be a little temperamental. I knew it was on its last legs so to speak. 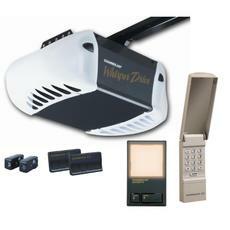 I asked for a new one for a Christmas gift and finally got around to installing the new garage door opener in July. This post is to talk about my experience and how I saved the installation fee. It is always easy to remove things and take them apart, in most cases. It certainly was in this case as well. However I did do a little bit of planning so that avoided removing pieces of the old installation that I was going to need with the new opener. This made the job a lot easier as well. Basically on the garage door itself there is a bracket that is used to attached the opener to the door. This was saved and reused. The motor portion hung from the ceiling with a series of metal braces. Although not perfectly adapted for the new opener, I was able to reuse all of the mounting brackets and hardware without having to remove it from the ceiling. This is really the best advice that we can give at this point. In my case they were step by step and easy to follow. We are not going to quote them here since every door opener will be different. One thing we can say is that you should read ahead and understand the big picture before starting. Have all of the tools you need to have close by and arrange for someone to give you a hand at a critical time when it comes to physically hanging the motor and track. There is a lot of preparatory work you can do ahead of time. The biggest time consumer for me was running all of the new wiring. I removed the old wiring and installed the controls, but then you have to run the new wire in as well. This is recommended since you want to avoid any potential problems with old wires that might be corroded or damaged in some manner. My old garage door opener did not have sensor to detect an object that was blocking the door from closing. Sensors must be installed a foot from the ground and wires run back to the motor. These sensors will stop the door from closing if there is any kind of object blocking the opening. These sensors also turn the lights on if you walk between them, which is a really nice security feature at night when your garage is dark and you want to avoid obstacles that could have been left behind in the way. Once I was ready, I asked one of my neighbors for a hand to hold the ladder and lift the track up to me until I could permanently attach it to the mounting brackets. This took about 5 minutes of work and about 25 minutes of chatting about the news and people on the street. Although interesting, this can be a time waster, especially if you are in a hurry to get the job done. That’s about it. As we mentioned earlier read the instructions from cover to cover before starting, plan your work and reuse as much of the mounting brackets as you can to make the job easier if you are replacing an old garage door opener. This is definitely a do it yourself kind of job for the average person with the right tools. Take your time and be safe – unplug the old opener before you start working and get someone to hold your ladder when you are on it. Comments about your experience of installing a garage door opener are welcome.